The force modulation mode kit contains everything required to set up and perform force modulation AFM imaging. 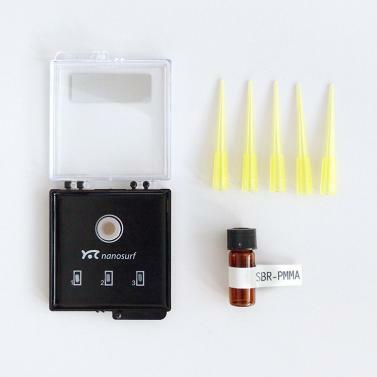 The kit includes a set of cantilevers and a polymer blend sample composed of styrene-butadiene-rubber (SBR) and poly(methyl methacrylate) (PMMA) that can be easily prepared on site to always start with a fresh and clean sample surface. Topographic image of a SBR/PMMA surface prepared by drop deposition on freshly cleaved mica. The image size is 9 µm x 9 µm, the height scale is 220 nm. Simultaneously acquired force modulation amplitude signal rendered on top of the sample topography. The cantilever was driven with a small excitation amplitude at its contact resonance frequency. Amplitude range: 45 mV. The SBRS-PMMA polymer blend sample provides a surface that allows abservation of both phase and amplitude differences between different phases of the sample. The size of the features may vary from preparation to preparation and depend on the way the sample is prepared.